Feeling Creative? Excellent! It’s time for our Writing Competition! 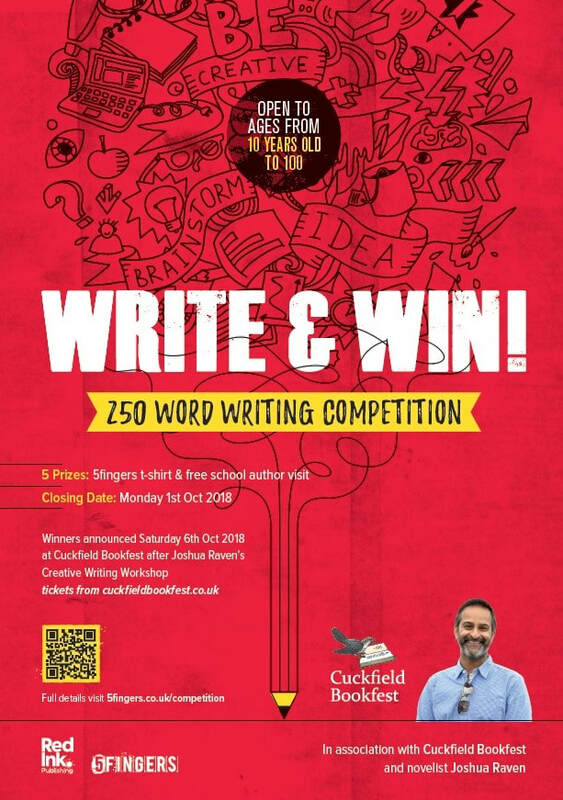 We would like to invite you to enter our 250-word writing competition, run in association with Cuckfield Bookfest 2018 and Joshua Raven. The competition is open to ages 10 years old to 100, and the closing date is Monday 1st October 2018. Are you ready? We are looking for interesting, unusual, descriptive or surprising stories, descriptions or poems. So experiment and have fun! For inspiration and tips, check out Joshua Raven’s creative writing tips. The 5 winners - one from each category - will receive a 5fingers T-shirt, a copy of Joshua Raven's 5fingers: initiation and a free school author visit for their school, or, for the adult winner, a school of their choice. Winning entries will also be published online, on Joshua Raven’s blog. Tickets for Joshua’s entertaining and creative event are available from Cuckfield Bookfest from August 2018 – so come along! Stories must be submitted by an adult (parent / guardian). You can email your entry to competition2018@redinkpublishing.co.uk or submit by post to: Writing Competition, Red Ink Publishing, The King’s Centre, 33-35 Victoria Rd, Burgess Hill RH15 9LR. ​Finally, the closing date for all entries is 11:59pm Monday 1st October 2018. Once again, please read the Competition Terms and Conditions and our Data Privacy Information here. We are looking forward to receiving your competition entry and reading your creations!